The Woolworth Sit-In That Launched a Movement Franklin McCain, one of the college students who sat at a whites-only Woolworth lunch counter to protest segregation in 1960, talks with Michele Norris. 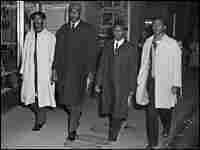 The sit-in sparked more economic boycotts during the civil rights movement. 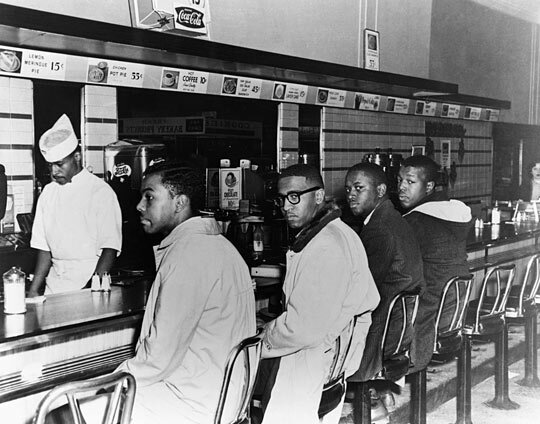 Joseph McNeil (from left), Franklin McCain, Billy Smith and Clarence Henderson sit in protest at the whites-only lunch counter at Woolworth during the second day of peaceful protest, Feb. 2, 1960. 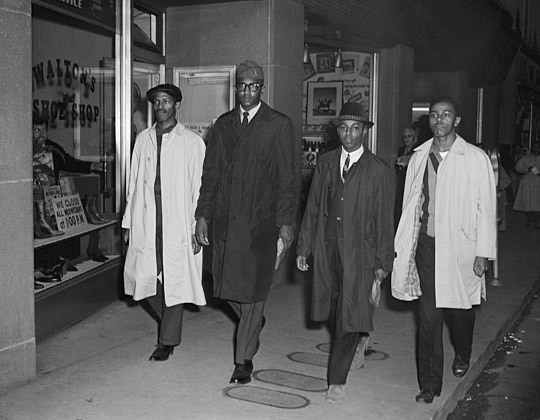 But the manager of the Greensboro Woolworth had intentions of his own — to maintain the lunch counter's strict whites-only policy. "Fifteen seconds after ... I had the most wonderful feeling. I had a feeling of liberation, restored manhood. I had a natural high. And I truly felt almost invincible. Mind you, [I was] just sitting on a dumb stool and not having asked for service yet," McCain says. "It's a feeling that I don't think that I'll ever be able to have again. It's the kind of thing that people pray for ... and wish for all their lives and never experience it. And I felt as though I wouldn't have been cheated out of life had that been the end of my life at that second or that moment." McCain shares his recollection of the exchanges the four African-American men had with the lunch-counter staff, the store manager and a policeman who arrived on the scene — and also a lesson he learned that day. An older white woman sat at the lunch counter a few stools down from McCain and his friends. "And if you think Greensboro, N.C., 1960, a little old white lady who eyes you with that suspicious look ... she's not having very good thoughts about you nor what you're doing," McCain says. Eventually, she finished her doughnut and coffee. And she walked behind McNeil and McCain — and put her hands on their shoulders. "She said in a very calm voice, 'Boys, I am so proud of you. I only regret that you didn't do this 10 years ago.'" McCain recalls. "What I learned from that little incident was ... don't you ever, ever stereotype anybody in this life until you at least experience them and have the opportunity to talk to them. I'm even more cognizant of that today — situations like that — and I'm always open to people who speak differently, who look differently, and who come from different places," he says. 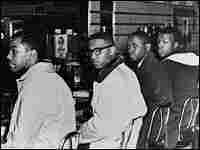 On that first day, Feb. 1, the four men stayed at the lunch counter until closing. The next day, they came back with 15 other students. By the third day, 300 joined in; later, 1,000. The sit-ins spread to lunch counters across the country — and changed history.